Being prepared does not only mean being prepared for the challenges of an adventure or activity – it also means preparing for an unforeseen emergency. Emergency events can be caused by people, or they can occur naturally. These emergencies are called natural disasters. Different places are prone to different kinds of disaster. 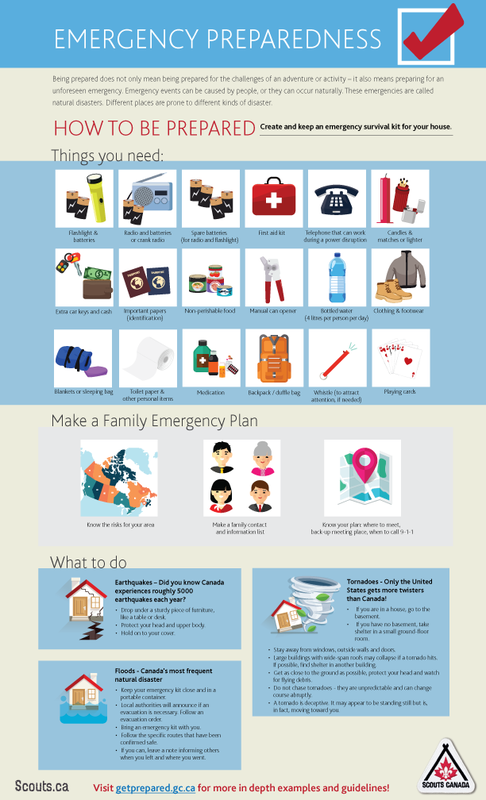 Create and keep an emergency survival kit for your house. Earthquakes – Did you know Canada experiences roughly 5000 earthquakes each year? Drop under a sturdy piece of furniture, like a table or desk. Protect your head and upper body. Hold on to your cover. Keep your emergency kit close and in a portable container. Local authorities will announce if an evacuation is necessary. Follow an evacuation order. 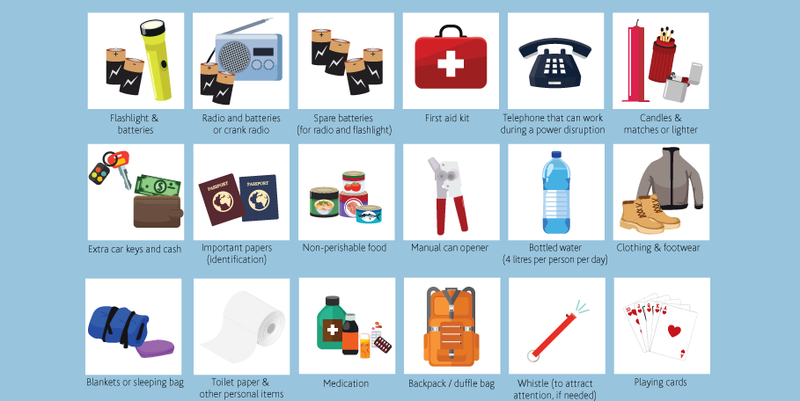 Bring an emergency kit with you. Follow the specific routes that have been confirmed safe. If you can, leave a note informing others when you left and where you went. Tornadoes – Only the United States gets more twisters than Canada! If you are in a house, go to the basement. If you have no basement, take shelter in a small ground-floor room. Large buildings with wide-span roofs may collapse if a tornado hits.If possible, find shelter in another building. A tornado is deceptive. It may appear to be standing still but is, in fact, moving toward you. 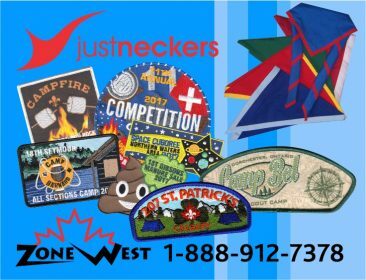 Visit getprepared.gc.ca for more in depth examples and guidelines!